What is an Air Admittance Valve and why do I need one? This project explains how air admittance valves (or Durgo valves as they are sometimes known) work to maintain trap seals and siphons within the waste pipework of baths, basins and other conveniences. Trap seals are necessary to keep foul smells and gases from entering into any room space where appliances with waste traps are present. You will also learn how to install an air admittance valve into an existing or new waste pipe system. It should also be noted that Building Regulations apply to the installation of air admittance valves in respect to where they can be installed. What are Air Admittance Valves and Why do we Need Them? Commonly called Durgo valves, air admittance valves (or AAV’s as they are also know) are designed to decrease the number of pipes that need to penetrate the roof and walls of a property. They reduce the number of parts required to ventilate soil and waste removal systems and do not compromise the performance or either. 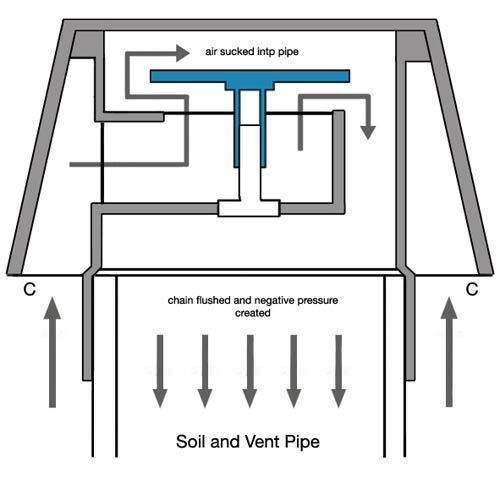 You may be thinking – Why do we need to circulate air in and around drainage systems? This is a valid question. 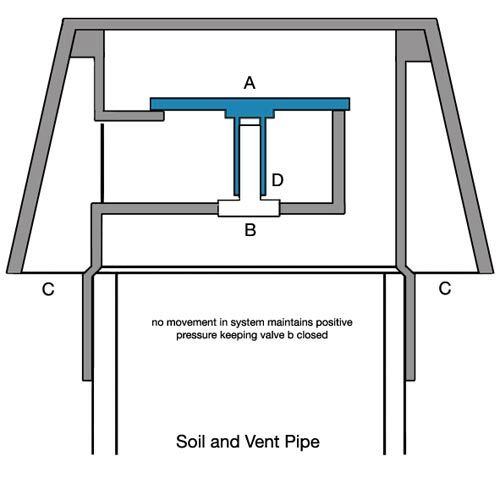 The reason for this is that these essentially let trap seals within the system work correctly and effectively by creating negative air pressure in the system. 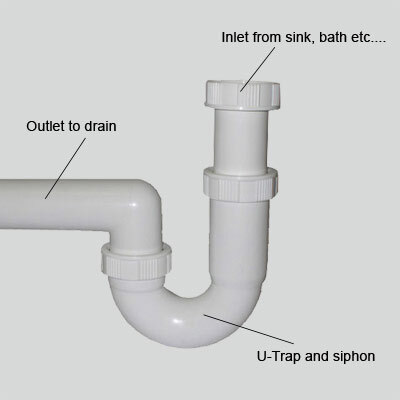 In terms of the trap seal, you may be more familiar with the terms "U-Trap" and "P-Trap". These are the P and U-shaped pipes that are commonly found beneath most sinks in the home. Water is held inside the U shape that then creates a seal between rest of the pipework and the internal area of the property. This helps keeps any gas and bad smells from entering the internal air space of a property and also helps to create a siphon when waste water is poured or flushed away. You may be familiar with the typical "gurgling" sound that a sink can make. This is evidence of the siphon working. When there is no water flowing, water is trapped by gravity in the U section, creating the seal and siphon and holding back the affore mentioned smells and gases. How does an Air Admittance Valve Work? The valve labeled D in the below image is held under the pressure of a light spring. The spring holds the valve closed during times of non activity in the drainage system. The positive air pressure of the room holds the valve down as well as the spring. When the toilet is flushed, the turbulence and gravitational pull of the water to the manhole below causes negative pressure within the pipework. This opens the Diaphragm A and valve B allowing fresh air to be sucked in through the side vents C and down into the system. The equalisation of pressure prevents the foul air from escaping and the water seals in the traps (bath, toilet and basin) from escaping. Air admittance valves, when installed, must finish above the highest flood level of the space the valve is in. E.g. 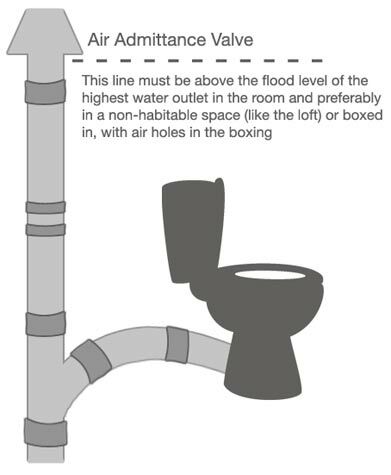 If the valve is in the same room as a wash hand basin, it must be higher than the overflow of that basin. This is so the pressure equalisation can occur without breaking the water in the traps. Air admittance valves are easily fitted and sliped onto the top of a soil and vent pipe for venting waste pipes of this type and they can also be easily fitted into existing basin, sink and bath pipework. In most cases you will be installing into existing waste pipework but if you are starting from scratch, this is a little easier. The first job is to locate the correct area for you valve. Remember, check with the building regs and also your local building control office to confirm exactly where the valve will need to go and how hight it will need to be. 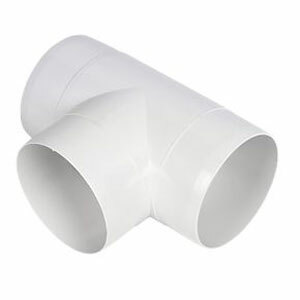 If you are fitting into existing pipework, you will need to install a "sanitary T-piece". The T-piece will allow the existing drainage to work plus provide a spur for the valve to be fitted onto. In the image above, the existing drainage will continue along the straight couplings, while the air admittance valve will be fitted to the upright T section. the easiest way to fit the T-piece is to place it against the existing pipework in the exact place that it is going to go and then mark on the existing pipework the two ends of the section that needs to be cut out and replaced with the T-piece. In terms of making the cut, you will only need to remove enough for the main body of the T-piece. There should be a collar either end that the existing pipework will either slot into or over that is then normally sealed using PVC solvent weld. In some cases you may be using compression fittings (rather than gluing using solvent weld, screw-up compression joints seal the pipework together). 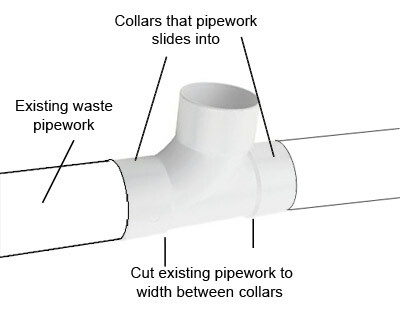 Again, there will be collars either end so you will only need to remove enough of the existing pipework to accommodate this section of the T-piece. To actually make the cut, you may find it easier to remove the entire run of pipework from its current location and doing the cutting somewhere with a bit more space. This has several advantages in that you will have a lot more space and your cuts will be much straighter. There are several tools that you can use to cut the pipe – a hacksaw or a pair of PVC pipe cutters. Both will produce the required end result but you may be better using the pipe cutters if you have some or can get hold of them. When using the hacksaw you will have to make sure that you cut in a dead straight line which can be quite tricky to do. Additionally, you will be left with "burrs" that you will need to remove with a file or sandpaper. When making you cut ensure that the pipe is clamped and cannot move. For this you can use a vice of clamp. Don’t put too much pressure on it as you could crack it. If you do have access to some pipe cutters these will give you a really nice, clean cut with no burrs, so these are really you best choice. Once you have made your cut, insert the two ends into the T-piece to make sure they fit correctly. Don’t glue them in place yet, leave this job until everything is back in place and you know it all fits. If you removed all the pipes to cut them (which in most cases is much easier) then its now time to get it all back together and make sure everything fits. Connect all the pipework back up, including the T-piece and check everything fits snugly. Once you have confirmed this, using some solvent weld, glue the T-piece in, joining the pieces of waste pipe together. Ensure that the open top of the T is pointing in the correct direction for the valve (this will mostly be upwards). If you would like more information on using solvent weld to glue PVC pipework check out our project here. Before you progress any further you will need to leave the solvent weld to cure for the manufacturers specified time. Refer to the packaging for guidance on this. With all the pipework in place and the valve securely fitted, give the valve a test to make sure all is working ok and you’re done! The use of air admittance valves are governed by Building Regulations and cannot be used in all cases. For more information on their use you will need to check these regulations before attempting an installation. Please see Building Regulations Approved Document H for more information. Connecting A Washing Machine Or Dishwasher Including The Waste Pipes.